High quality, suitable shower drainage is included to former, it comes with 600 mm long steel linear and drain. It also comes with grating which is 64 mm wide, leaving 8 mm wide channel for water to flow. Invisible is a specific drain type without vertical frame, making it suitable for range of finish materials, from vinyl to marble and stone. Grate is flushed with the frame, so there is no requirement for finish material height, although channel protrudes below the bottom shower tray surface for 10 mm. Special degreasing cloth is included to clean the steel surfaces before gluing the finished floor surface. Height from the shower tray surface to the top edge of vertical upstand is 15 mm, it also goes below the tray for approximately 5 mm. McAlpine siphon trap with capacity of 26 l/min. Waste can be rotated and it's height adjusted giving much flexibility during installation. Showerlay is complete unit with everything you need. Suitable shower drainage is included to former, it comes with 600 mm long steel linear end drain. It also comes with grating which is 64 mm wide, leaving 8 mm wide channel for water to flow. 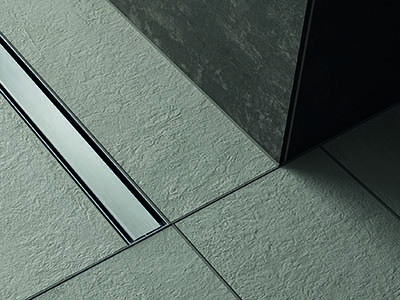 Invisible is a specific drain type without vertical frame, making it suitable for range of finish materials, from vinyl to marble and stone. Grate is flushed with the frame, so there is no requirement for finish material height, although channel protrudes below the bottom shower tray surface for 10 mm. Special degreasing cloth is included to clean the steel surfaces before gluing the finished floor surface. Height from the shower tray surface to the top edge of vertical upstand is 15 mm, it also goes below the tray for approximately 5 mm. McAlpine siphon trap with capacity of 26 l/min and 20 mm high water seal is also included. Showerlay is complete unit with everything you need. In the set there are suitable shower drainage, it comes with 600 mm long steel linear end drain. It also comes with grating which is 64 mm wide, leaving 8 mm wide channel for water to flow. Invisible is a specific drain type without vertical frame, making it suitable for range of finish materials, from vinyl to marble and stone. Grate is flushed with the frame, so there is no requirement for finish material height, although channel protrudes below the bottom shower tray surface for 10 mm. Special degreasing cloth is included to clean the steel surfaces before gluing the finished floor surface. This is perfect linear channel for tiled floors, as the lip height is 15 mm. It also goes below the tray for approximately 5 mm. McAlpine siphon trap with capacity of 26 l/min and 20 mm high water seal is also included. Shower tray 900x1700 mm is the second largest wet room kit in our offer. With great amount of sloped space provided, you can DIY and refurbish your old fashioned bathroom into a modern and contemporary spacious restroom. By avoiding additional cuts in tiles shower tray will look even more excellent. Showerlay allows for quick and easy wet room flooring installation and use. OneWay Fall shower tray gives the installer easier task and complete flexability of building own wet room. The biggest in our store, wet room kit 900 x 1850 mm is shower tray that can be installed in rooms with very large amounts of space. A walk in shower flooring opens up the bathroom and adds modern simple and fresh look creating a more attractive restroom. It offers people with mobility issues easy accessibility. Showerlay of that size is particulary suitable for large tiles format, although it can still be laid with even small mosaic. By using OneWay Showerlay our clients are avoiding additional cuts in tiles. Chat started. Session ID: 1556195268. You are now connected to: David M.